This is a reprint of the letter from the editor in Unwinnable Monthly Issue 94. You can buy Issue 94 now, or purchase a monthly subscription to make sure you never miss an issue! This month’s issue is very exciting. 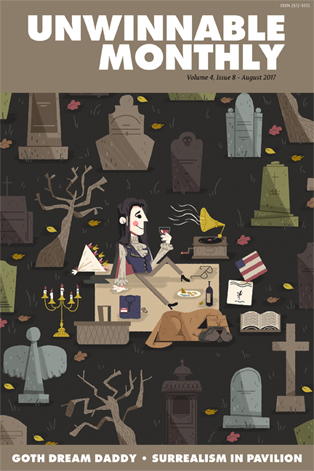 First off, you’ve already seen Shafter Brown’s goth-tastic cover. That accompanies a story by Deirdre Coyle on how Dream Daddy, the latest dating sim sensation, gets goth right. I’ve long admired Coyle’s work and am thrilled to finally get her in the magazine. Suggested listening: any given Sisters of Mercy song. Or all of them. Go nuts, treat your goth self. Our second features is by Rachel Watts and digs into the Surrealist art movement’s influence in videogames. “Surreal” is a word that gets thrown around a lot independent of its actual meaning. Watts does a fascinating job of grounding it again, through the wonderful puzzle game Pavillion and a survey of great Surreal artworks. Suggested listening: Eric Satie’s Parade for four-handed piano. There’s an accidental theme is several of the columns this month, with Rob Rich, Corey Milne and myself all tackling aspects of nostalgia. For those, why don’t you torture yourself with Giorgio Moroder’s Neverending Story soundtrack. Gavin Craig examines the moral agency of the game The Fall – “The Damnation of Faust,” by Hector Berlioz, makes for a nice accompaniment. Jason McMaster also digs into morality, in his case in recently released game The Long Dark. Fire up John Carpenter’s theme for The Thing for that one. Meg Condis’ documentary of the month is Nobody Speak: The Trials of the Free Press, which is a chilling look at Peter Thiel’s war on Gawker. Naturally, you should set “Nobody Speak,” by DJ Shadow (featuring Run the Jewels) on repeat for that one. As usual, Casey Lynch brings his own soundtrack: the best metal of the month. August is a heavy month in metal land. That Dead Cross album is hard to beat, but I’m also super into the new Prong and Cormorant platters, if you want my two cents. Amanda Hudgins returns to her fanfiction column after a short hiatus. I am not going to intro this one, though, you’re just going to need to read it. Fun fact: this was the most difficult-to-illustrate Unwinnable article to date. For aural accompaniment, try out Pornosonic. Brock Wilbur digresses slightly from his mission of examining the underappreciated horror games of the 20th century to look at Spelunker, a game that just scared the crap out of him when he was a kid. Get overly dramatic for this one with the soundtrack for The Descent. Matt Marrone got a little Twitter famous at this year’s Newport Folk Festival. The story revolves around the traditional song “Willie o’ Winsbury” as covered by Offa Rex, which makes it a natural pairing. For our sponsored Q&A, I chatted with Ape Law about their psychedelic horror game Albino Lullaby, which is very good. Listen to The Handsome Family’s “Grandmother Waits For You” for that. I also had a punchy chat (pun intended) with our cover artist Shafer Brown. It feels very Dead Milkmen to me, but your mileage may vary. If you want even more music recommendations, our Playlist this month is long and very weird. 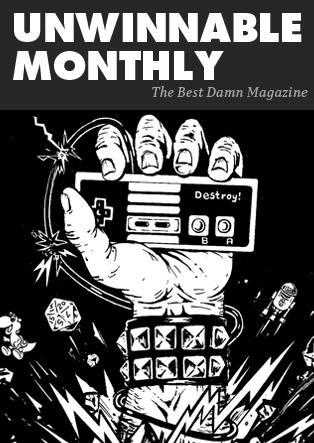 We’ve also got a ton of book and game recs, and Brian Taylor’s crossword – my favorite part of every month. That’s us for August. I hope you enjoy it and come back to see us in September!